Hi, I know it's been two years since your post but maybe someone sees this comment? So, I made my own deodorant today using: bicarbonate of soda, arrowroot powder, coconut oil, brazil nut oil (instead of shea or cacao), tea tree oil and bio-oil (instead of vitamin E oil). The process went smoothly, it was so easy, it looks good and smells good. But the texture worries me. It feels grainy, like super-fine scrub. Is it supposed to be like that? I think it should be okay, Tamara. It's probably just the soda that isn't quite dissolved, which is normal. It shouldn't irritate your skin, but if it does, I'd try heating it slightly till everything melts, then see if it feels smoother. I cannot believe how well this works! My husband thought I'd fallen right off my rocker when I told him we were switching to Homemade deodorant. Well!... Hubby works out side and it has been above 40 celsius (104 F). Normally, on days like this he would come home very stinky! He cannot belive how well this has worked to keep the smell at bay. I tell everyone about this recipe! Thank you so much for sharing it. I will NEVER buy store bought deodorant agian. Thank you, thank you, thank you! Since puberty I've been a heavy sweater. 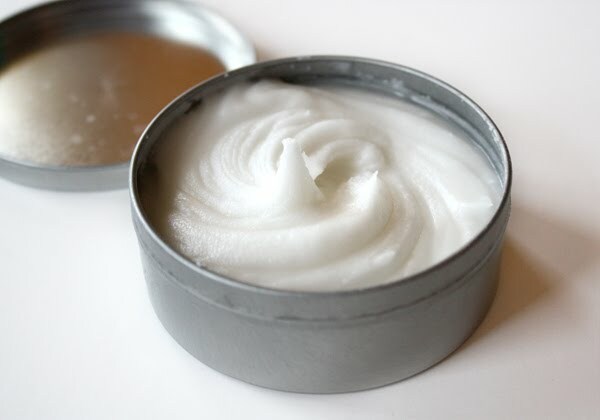 Once I made my own deodorant using this recipe, I am almost never damp and I NEVER smell! I too have the discolored/gross looking pits. I've tried scrubbing/exfoliating, but nothing makes it go away completely. Any other suggestions?? Otherwise, I totally love this stuff! Alyson, are you saying your pits are discolored because of the deodorant? I've never heard that one before, and I sure wouldn't know why it would happen. I tried to read through all the comments to make sure I wasn't adding anything that had been answered before, but I gave up after about 10 minutes. I have been using this for about a month now, and LOVE it — however my skin often breaks out into a sore rash or is itchy. It feels a little abrasive on my skin (I'm assuming that's the baking soda). Would adding aloe juice/gel or something else help alleviate this? Vitamin E oil? Any ideas? jabberwo0cky... I'm sorry, but I don't know if adding any of those things to the recipe would help or not. It might take some experimenting on your part. Do let us know if something you try helps! My only suggestion would be to use as little of the deodorant as possible, and try to avoid the rash areas if you can until they clear up. It really only takes a tiny amount of the deodorant for it to work! Grandma G, yes once I started using this recipe my underarms became discolored. Like I said before, Alyson, I sure don't know why that would happen. Could it be dye from your clothing or something? The only thing I can think to suggest would be to use less. Like I told the last commenter, it only takes a tiny amount for it to work! Do report back if you find a solution! I've been using this for about a month - works great! I am suggesting it to all my friends - thank you so much for sharing! Well, I tried this and something went wrong so I'm gonna try again. Have used this recipe all summer. LOVE IT! No odor whatsoever. For me, it does not stop wetness. I guess that's something I will have to learn to live with? Yeah, Paula... it's just a deodorant, not an antiperspirant. Glad it works for you! Wow! Thank you so much for putting this recipe out to the world! I hope it works... I've been using Kiss My Face brand, which has kept away the B.O., but unfortunately I smell like the product and am not particularly fond of the scent. I decided to search for Pina Colada scented deodorant out of the blue, and here it is! You're awesome! Hi Grandma G! I made this deodorant based on your recipe and LOOOOOOVE it. I honestly believe it's the best all-natural stuff out there and I just wanted to thank you! I wrote about it on my website and took some pretty pics. I hope more families jump on the hippie bandwagon! I gave up antiperspirant ages ago and began using this recipe for two years now. It's the most effective natural deodorant I've ever used. The baking soda can cause skin irritation over time, so I cut back on it by about half and it has still worked beautifully. I've shared this recipe with many! My husband and I have been using this recipe (with cornstarch for now...couldn't locate arrowroot powder) for a few weeks and I LOVE IT!! I haven't had success like this with a deodorant in years. Thank you thank you!! We had tried just baking soda and cornstarch with some success but the coconut oil completely changed the formula! Definitely making this a household staple! I recommend that people DO NOT use lime oil in place of grapefruit unless you are certain that your skin will not turn black suddenly in the sun. Some people will have a reaction to lime, and also celery, and it turns skin very dark, very quickly. My case: Lime juice spritzed on my fingers when squeezing it into water, and the sunshine turned the spritz spots into black dots, which took weeks for it to disappear. Regarding the vodka question, I'm afraid I don't know! I'm curious to try this out, but I have one reservation... Will it destroy my bras? I'm the type of person that wears their collection of bras until I am on the last one and then wash them all, so they sit for quite awhile before I wash them. I know that skin oils contribute to the elastic wearing out (oil and rubber don't mix) and was wondering if the deodorant would accelerate this process or not. So are your brassieres wearing out faster? I have not had that problem, but I never get any of the deodorant on my bras, either. I don't know why you would unless your bra fits way up into your armpit. It doesn't take much of the deodorant for it to work, just a small-pea sized amount, so it shouldn't be spread farther than your innermost armpit. I've been using this deodorant for years and it works better than anything I've ever bought! I add a few drops of tea tree oil for additional anti-bacterial power and whatever essential oils I want for scent. Best ever! A fashion consultant at my old job told us to use Pine-Sol, the original scent and brand to remove even set in oil stains. I guess you rub it on the oil spot, then wash out the Pine-Sol by hand with dish soap and rinse well before putting in the washer. Otherwise when it gets to the dryer it could be unsafe. I never tried it myself, but I told a co-worker about it and she was so happy about it she startled me as it saved several of her tops. I have been using Toms too, just found this recipe tonight. But that causes darkness in the armpits on some people too. On Toms website someone said lightly scrubbing with a loofah got rid of the darkness. You may see if that will work. Tried the recipe and found it works a treat except for the slight gritty feeling. also try just plain cheap white vinegar, it won't stop you sweating, but will stop B.O. for at least 24hrs. Much cheaper than the alternative. I did not read all the 230 comments......if I am reiterating my apologies. If you live in a warm state (AZ for me) you might want to make sure that you put your deodorant in a jar of some kind so it does not leak. My coconut oil does not stay solidified in the summer heat - even in the house. okay so im wondering where you get the grapefruit essential oil? and do you really need to add it because it seems expensive! We got the grapefruit oil at Whole Foods. You don't need to add it if you don't want to. ok thanks! why do you add it anyway? just wondering and does it leave any stains with shirts because if it does it there anything i can stop that with?? Soph, the essential oil is added mainly for fragrance, but it also has antibacterial properties. You can use whatever scent you like best... doesn't have to be grapefruit. Heading off to Whole Foods to get my arrowroot powder and I'll be making this today! I made this yesterday and apart from having to apply it with my fingers, I love it so far! I used lavender essential oil instead of grapefruit, but I'm thinking next time I'll add a bit of teatree oil for the anti bacterial properties teatree provides just for a little more protection against stinky bacteria. I feel dry, even though I was expecting it to feel oily because of the coconut oil, but nope, just dry and soft. I'm willing to bet that I'll stop getting ingrown hairs in my armpits now because there's none of that waxy residue left behind by store bought deodorant. I'll comment about that after I've been using it a while. Okay, I made it yesterday and so far I love it! I expected it to feel a little oily due to the coconut oil, however it feels completely dry and soft. I am no more smelly after 15 hours of wear than I would be using regular store bought deodorant. I think next time I will add a few drops of tea tree oil for some added anti bacterial benefits. The only thing I'm not keen on is applying it by hand, but since it's water and soap soluble, it's nothing to simply wash my hands after applying. Thanks so much for this great recipe! So far I'm extremely pleased! Thanks so much for this recipe. I've tried it out and have found it works really well and smells good too! Anonymous... if you happen to check back here, could you post some links for where you found that info? I'm not finding much to back it up. Thanks! Hi, Andrea... glad you like the deodorant! I'm not sure what would make your underarms turn dark. I've not had that problem with this deodorant even after nearly 3 years of using it. If I were you, I'd google "underarms turn dark" or some such wording. I found a lot of information out there, and you might give some of the removal tips a try. Good luck, and please post back if you find a solution! I have tried at home and it really worked and I am thankful to you for this recipe. I use vodka in "french cleaning" (equal parts vodka/water)dry-clean only clothing in between cleanings. The vodka kills the odor-causing bacteria without staining or leaving watermarks on delicates (like silk). Just made a batch and put it on. Waiting to see results. I suffer from excessive sweating and even though rainy old London isn't hot I sweat in cold weather. I know this wont prevent me from sweating but can't find a deodorant that will last all day and am not interested in spraying aluminium into my body, soo I'm excited to see if the fragrance lasts. I started using this a few months ago, totally love it! Won't go back to using store bought deodorants. It works amazingly!! This is the best thing since sliced bread! I LOVE IT AND WILL NEVER GO BACK! 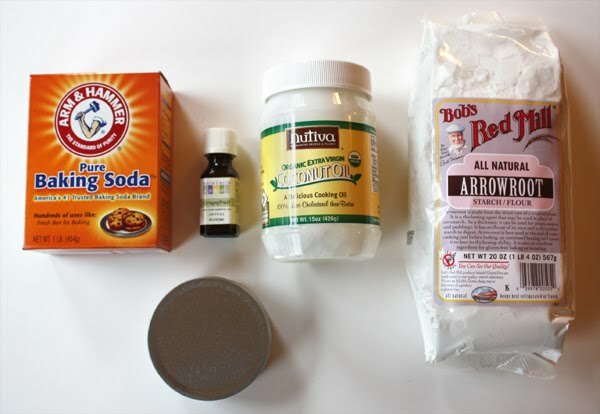 I am going to use less or no baking soda, next time because during the day, it starts to burn a little but this works better than any store bought deodorant I've ever used. Thank you, thank you, thank you! Ahhhh... I love happy "customers"! Thanks for letting us know, you guys! I didn't know one could have such different armpits - too funny! Good luck with your balancing act! Thank you for your kind wishes... same back to you! I have already done this and it works AMAZING!! But...what is the consistency to be? Could I leave it in the fridge and put it in an old roll up deodorant container? You could try that, Anonymous. I think others have done it. I'm wondering, though, if it might get a bit too hard? If you give it a try, would you post back and let us know how it works for you? Made up a batch & used patchouli, lavender, & tea tree in place of the grapefruit. I have three "strike outs" in my drawer of other natural deodorants that wouldn't get me through the day. I was pleased today when I made it through, & snuck a sniff test in periodically throughout the day. When I got home, I noticed several red, painless, non-itchy bumps on my skin. Thought I might b allergic to something, but did a test strip on my arm with no problem. If anyone still follows this, any suggestions? I'm so thrilled I finally found something that worked....I hope I can continue use! I don't know what would be causing the bumps. I'd give it another day or two and see what happens. If they get worse, I'd try making a small batch without any essential oils and see if that makes a difference (the oils aren't necessary). If it helps, then add back the oils, one at a time, and maybe you can tell which one is doing it. I'm glad the deodorant worked for you. I hope you can figure out a way to continue using it! Post back and let us know the results. Thanks, will do. I have used all those oils before, but not ever under my arms. I will hold out for a while and let u know. Ok. Update. Still using it & it works great! The bumps have gone, & I did some investigating. I think the rash was more correctly attributed to a medication I began at the same time, because as I stopped use of the medication, the rash went away. You don't know how glad I am it wasn't the deodorant because this stuff is amazing! The only aluminum free product that has ever worked!! Awesome! Thanks for the update, Jenny! I too used this and loved it for at least 5 months and then when it melted n re-settled in jar in travel bag it gave me a bad yeast infection. I got rid of it with vinegar n just using coconut oil for a while. Went back to this recipe and after another couple weeks yeast infection came back n now its worse... :( it sure itches! it must have been an imbalance of the baking soda... saw comment about alluminum free but I'm sure mine is. Suggestions? I'm thinking adding vitamin E lotion or more coconut oil in recipe might help. Did you use cornstarch or arrowroot powder when you made yours? If you used cornstarch, that could be the cause. Other than that, I really don't know. Please post back if you find a good solution... it might help others. So I've been using this now for 3 weeks and my armpits are not reacting right to it or something, they are red and blotchy and I'm actually breaking out. I used a high grade coconut oil, organic arrowroot starch so I'm not sure if this just disagrees with my skin. I used lavender oil so maybe I'll omit it and try agian. I was so excited to see the positive reviews, and I am going to go try to make his this weekend. I was wondering if this deodorant melts in the summer. I like to carry a little lip balm container filled with deodorant, that I keep in the fridge to solidify a little. If i kept that in my bag in the summer would that spell disaster? I can always keep it in a little jar. I just needed advice on the best method since you have used this deodorant through the seasons. Also, does the strength of odor protection hold up in the summertime. Right now its winter and I can get away with a lot :) when it becomes hotter do you find that you need to add a lot more powder, baking soda, or do the measurements stay the same? Thank you. I know its a lot of questions. The coconut oil melts at 76 degrees (F), so I wouldn't recommend the lip balm tube if your bag is going to get that warm. My deodorant in a jar hasn't melted in the house, bit it's definitely softer in the summertime. I use the same measurements in the summer, and it works equally as well as it does in the winter. This recipe works wonderfully! You do perspire with it, but no bad smells at all. It doesn't transport well via plane - the low temps in the baggage compartment changed the consistency to a hard texture that required warming in my palms prior to use. Tried this once and didn't go so well because I used a body oil instead of EO. Tried again this year using a small amount and loved it! I just made another batch using larger amounts this time. True it does not stop the wetness but absolutely no order or stain on my clothes. I'm sold!!! I got a couple of baby food jars from friends to put mine in. Perfect size and you can even decorate it to make it look pretty. I see no reason to pay for deodorant ever again. I love this recipe for deodorant . I add a few drops of tea tree oil for the antibacterial properties and a few more drops of grapefruit essential oil. Needs no improvement. i used lavender and tea tree oil and it smells amazing with the coconut. I can't wait to try it on and see if it works. That was a very helpful article, Jamie - thanks! I'm sorry, Julie... I haven't a clue! I guess you could experiment with just a small batch? Thank you for the apple cider vinegar post! Sadly, I had to stop top using this deodorant b/c all of a sudden I broke out so badly - it was painful. I used this for well over a year before having a problem. I'll make a small batch & try the vinegar. Hi Sofia. I didn't even know they made a liquid form of coconut oil. I would bet that's the reason. They had to have changed it somehow to get it to stay liquid, since coconut oil melts at 76 degrees F, so perhaps it's lighter and tends to float. So maybe you need to stir it every time before you use it? Well,.. I'm considering your mums recipe & I appreciate it. I havent read the other comments, but I'm an herbalist & I know that when u use essential oils u must be mindful of the fact that within 20 mins or less the essential oils have permeated into EVERY cell in the body. Most recipes I use for like moisturizer call for 3 or 4 drops.. TOPS. More is needed for say a toilet cleaning product, but not for the body. So I will err on the safer side & slide back a bit on the amounts of essential oils. You decide for yourself what is best.. I can't even tell you how many deodorants I have tried. NONE WORKED. I did some research and tried this recipe and it works! I'm getting ready to make a large batch for myself and several friends. I use eucalyptus essential oil. Thanks for posting your recipe and all these great comments. Grandma G, I haven't tried this yet, but have suffered for years with excessive odor and wetness. I hope and pray that this recipe is a blessit breakthrough from God. Let it be so. Anonymous... this isn't an antiperspirant, so it may not solve your wetness problem (but it might help some). However, I'm betting it will definitely help your odor problem! Do report back on how it works for you, okay? I'm still using this and never plan to stop - I love it! I never worry about odor anymore. does anyone know if this clogs ur pores after shaving if put on? Is it coconut oil or cocoa butter? Actually, let me shorten the response time. Oils are rated on comodogenic ratings. This means if they block pores. Both coconut oil and cocoa butter are rated 4-5 depending on who is rating them. Michelle... I've been using it ever since we made that first batch, and I've never had a problem with it. Still loving it! hello Grandma G does this recipe stain ur shirt pits? and do u have to add shea butter or bees wax to make it thick? Hi Michele... I've never had a problem with my shirts getting stained. I don't add anything to the recipe to thicken it. 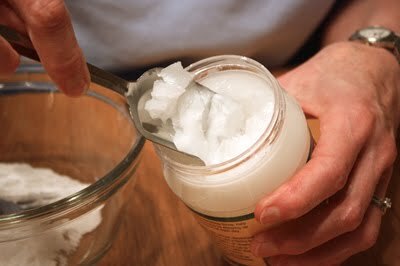 It will be thick as long as the temperature doesn't get above 76 degrees, which is the melting point for the coconut oil.